The debut of Amazon’s Alexa digital assistant on Windows 10 devices has been a long time coming, and is already on a select few laptops and desktops. But, Microsoft and Amazon are keen on leaning into this partnership, now widely showing off Alexa integration into Cortana on Windows 10. The Verge reports that Microsoft and Amazon have released a wider public preview of its previously teased deeper integration between the Alexa and Cortana digital assistants – available for everyone in the US right now. Microsoft told CNBC that it has no information on international availability. 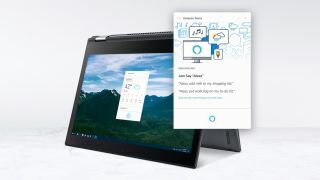 This preview on Windows 10 devices allows Cortana to summon Alexa for further commands with the “Hey Cortana, open Alexa” phrase spoken; and vice versa on Amazon Echo devices with the “Alexa, open Cortana” phrase. Both iterations of this integration are handled as a skill on each platform, with Cortana being an Alexa on Echo devices and Alexa being a Cortana skill on Windows 10 devices. What Alexa looks like through Cortana on Windows 10. What’s most intriguing – and refreshing – about this move by Amazon and Microsoft is that it’s so unexpected. It’s rare today for rivaling technology companies to band together in such a way, especially with proprietary, cutting-edge tech such as early artificial intelligence and machine learning. The major benefit of this, despite its admittedly clunky implementation at the moment, is for either assistant to have access to the other’s unique features while on a platform that doesn’t natively support them. For instance, you can access the Office specific functions of Cortana from your Amazon Echo speaker using the “Alexa, open Cortana” phrase. This feedback will hopefully result in the inclusion of some currently missing features, like music streaming and alarm clocks, as both parties intend to keep adding more over time. The move is also interesting in that it comes at a time where we see Cortana lagging a bit behind its competing digital assistants, namely Google Assistant, in its capabilities and versatility. We’ll see whether this shortcut sees Microsoft catch up to the rest regarding its more mainstream capabilities, like smart home and automotive applications.